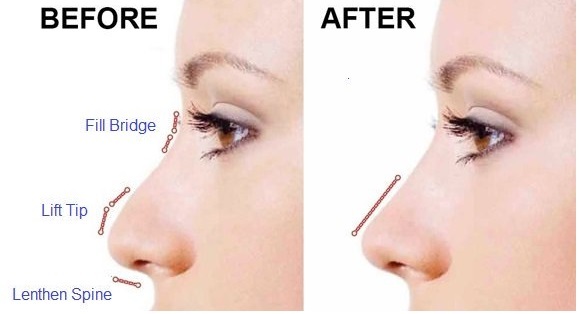 One of the most prominent features of the face is without a doubt is the nose, and those that decide to have rhinoplasty or a “nose job”, usually do so to achieve improved facial harmony. Rhinoplasty is a surgical procedure designed to reshape the nose, and is considered to be the most difficult of all cosmetic surgical procedures to perform. A large volume of patients who are dissatisfied with their surgical rhinoplasty, have a fear of having a revision rhinoplasty. Small deformities or irregularities may be challenging to correct with surgery, however if the problem is slight, a non-surgical injectable rhinoplasty can correct and or improve minor contour irregularities, and deformities from a previous rhinoplasty. Dermal Fillers are shown to be better at contouring than surgery, as they provide the ability to treat deformities without disrupting adjacent areas. Injectable rhinoplasty uses dermal fillers which are made of Hyaluronic Acid, such as Juvederm, Restylane and Teosyal. These fillers can be injected to straighten a nasal profile, lift a droopy tip, create a nose bridge, and smooth a visible bump. Dermal fillers should last between 9-12 months, depending on how quickly your body metabolizes the product. One of the greatest benefits of non-surgical rhinoplasty is that the procedure is reversible in most cases. If a patient is unsatisfied for any reason, a special enzyme known as “Hyaluronidase” can be injected into the treatment area. Because dermal fillers are not permanent, patients will need to return approximately every 6 months for touch-up treatments. Any time a correction is needed to fix a surgical Rhinoplasty with dermal fillers, be sure to see someone who is a Board Certified Plastic Surgeon, or an Ear, Nose and Throat Surgeon who specializes in Rhinoplasty. For more information on injectable rhinoplasty visit https://www.lastinglooks.ca/injectable-rhinoplasty-toronto/ at Lasting Looks Clinic in Toronto.